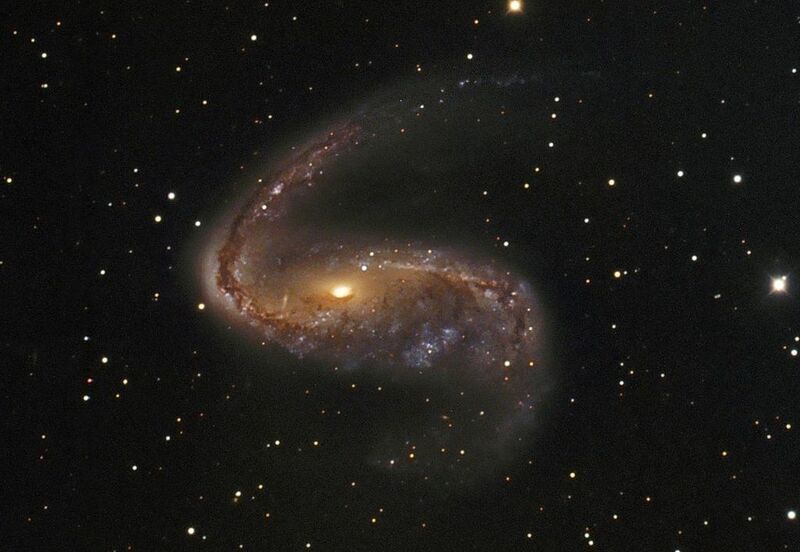 The Meathook Galaxy (NGC 2442 / 2443) is a distorted barred spiral galaxy of about 110,000 light-years across, located some 56 million light-years away in the southern constellation of Volans (The Flying Fish), while it is speeding away from us at approximately 1466 kilometers per second. The south-western part of the galaxy is designated NGC 2442 while the north-eastern part is designated NGC 2443. The galaxy has a small bulge, a pronounced central bar and two asymmetric spiral arms. One of these arms has a hook-like appearance, hence its nickname. Obscuring dust lanes, young blue star clusters and reddish star forming regions surround a core of yellowish light from an older population of stars. The longer of the two arms – which was the location of a supernova that exploded in 1999 – has intense star formation, due to the radiation of young stars ionising the gas they form from. The asymmetric shape and star formation are both thought to be caused by tidal disruptions from a close encounter with a smaller galaxy (not visible in this image) at some point in its history. The two interacting galaxies are separated by about 150,000 light-years. If there are no further encounters, the forces that hold the Meathook together will restore the galaxy to a more symmetrical spiral form. However, much more likely is that the companion has been captured by the Meathook’s gravitational forces and will eventually be devoured by it, triggering a dramatic burst of star formation. Associated with this galaxy is HIPASS J0731-69, a nearby intergalactic cloud of gas with nearly 1/3 the amount of atomic hydrogen as NGC 2442 itself that is devoid of any stars. It is likely that the cloud, which contains the mass of a billion suns, was violently torn loose from NGC 2442 by a companion. This image is based on data acquired with the 1.5-meter Danish telescope at ESO’s La Silla Observatory in Chile, through three filters.